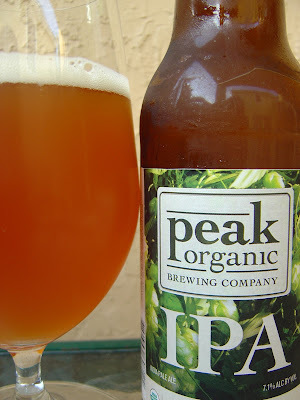 Today I'm drinking Peak Organic IPA brewed by Peak Organic Brewing Company in Portland, Maine. The very boring label says, "Pure ingredients, delicious beer". Best Enjoyed Before June, 2011. Citrus and pine aroma with a fresh orange and apricot fruitiness. Bitter fruity start, citrus and lemon rind. Fairly dry right away goes with some warmth from the 7.1% alcohol. There is some malt backing but this beer is nicely bitter throughout, easily winning any battle. Some medicinal flavors are apparent toward the end but you end up feeling your palate is clean and that you drank a crisp beer. Good carbonation, dry finish. An OK IPA. Nothing awesome, rather ordinary and average. Today's power word: Esurient -- hungry, greedy. Think ambulance chasers, for one example. I'm starting to see more and more "Organic" IPA's on the shelves. I've been wondering...what does organic mean for the flavor of a beer? Recently tried the Napa Smith Organic IPA, wasn't too impressed. Is this just another buzz-word marketing fad that's spilling over to the beer industry? There are still going to be good organic and bad organic beers, but it's not organic's fault. It's important to some people. Personally I'm not one of them. I've seen organic beers for quite a while but haven't noticed an uptick in marketing buzz. Maybe.